A great food movie is being released on DVD today (November 6th.) If you haven't already seen it, go rent or netflix (yes, "netflix" has become a verb, just like "google" did) Ratatouille, Pixar's latest animated feature. Normally, I'm not blown away by animated movies but I really enjoyed this one. Like Jim Henson's Muppets, Ratatouille is equally entertaining for kids and adults, especially for adults who like to cook. Ratatouille is the story of Remy, a French country rat who dreams of becoming a great chef after he gets inspired by the work of Auguste Gusteau, a Parisian chef whose motto is "anyone can cook." Remy has a highly sensitive nose--he's the designated rat poison sniffer-outer for the colony--but he longs to use his skills to create delicious food. Fate and his love of cooking conspire to tear Remy away from his family and dump him into a fast-flowing sewer drain. After a hellish ride throughy some gnarly tubes, Remy finally climbs up a drainpipe and finds himself in Paris, dripping wet and utterly alone, but miraculously staring up at the sign on Gusteau's restaurant... I won't spoil the rest for you. I loved the accuracy and detail of the cooking/kitchen scenes. The techniques and ingredients are impeccable; the restaurant scenes are accurate - the chefs, sous-chefs, pastry chefs, bus-boys, and waiters are all zipping around and bumping into each other in the controlled chaos and barely restrained animosity of the kitchen; the lone female chef, Collette, has a big chip on her shoulder about being a minority in a male-dominated field; and little details like the horizontal burn marks across the wrists of the cooks showed an impressive knowledge about cooking and an admirable devotion to realism. I also loved its message about the power of good cooking. Remy's love of food is so great that he is willing to leave his family and follow his chef's nose to Paris where he risks his life just to save a pot of soup that Linguini is ruining. 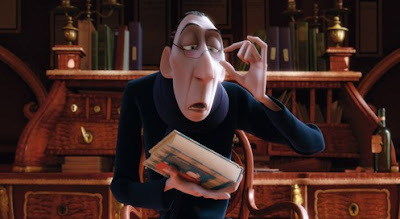 And Anton Ego, the fearsome restaurant critic whose brutal reviews result in Gusteau's death after his five-star restaurant is downgraded to four stars, becomes human only after his frozen heart is melted by a dish of Remy's ratatouille. 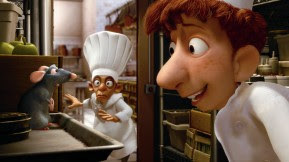 "Anyone can cook", the catch-phrase of the deceased Chef Gusteau, is echoed throughout the film. Although the film does contradict itself a bit because Linguini, one of the main characters, really can't cook, at least not without the help of the culinarily-gifted Remy, I still appreciated the democratic message.